Would it be a surprise if I said I first met Diane at a Tradeshow? Although I did not know her prior, several years ago we were asked to work a booth together. I have worked a lot of Tradeshows in my life, but I never saw anyone work one like Diane. She created an incredibly welcoming booth into which attendees could come. And they did come! The activity we had on that day was incredible! She knows her Industry and she is simply the best! I met Diane at a Tradeshow and she really has a way of connecting people! Diane recently worked a Health Fair for me in Hilliard, Ohio, which was not well attended. Despite the poor attendance, she was able to secure six quality leads for me, whereas, most of the other Exhibitors did not get any leads at all. I received feedback from the other Exhibitors who watched her and the wonderful manner in which she engaged with the folks coming through. They were very impressed with how Diane represented my company… she did a phenomenal job! Being in the Insurance Business, I found the idea of exhibiting at an event to be challenging when it came to creating an exciting booth and, in turn, to having spectators approach my table to engage in a conversation. 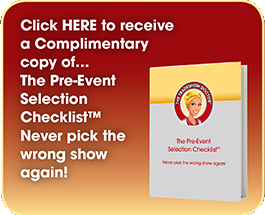 I was brand new to exhibiting and did not know that there is actually a science of how to display a booth and to know the right events to choose in the first place. I hired Diane to be my consultant for two Exhibits in 2014. Both of my exhibits were a success! I say this because the right audience approached my table. At one of the events, my booth was in the mix of large Fortune 500 Companies, my neighboring exhibitors all had nice, big expensive displays. But, their booths suffered in comparison to the crowd and participation that I experienced at my booth. Why you ask? They didn’t have Diane as their consultant to advise them of the Do’s and Don’ts of displaying their booth along with the proper etiquette from the exhibitor. I can say from my results that quality is preferred over quantity. I landed two big accounts from my exhibit space that will keep me busy for the upcoming year! It doesn’t matter how big or small your company is, you can increase your sales and maximize your time spent if you implement the consultative advice. By all means, Hire Diane! I have known of Diane’s work for a number of years and we engaged her to consult with a collective group of vendors who were exhibiting during a One-Day Educational Seminar we were hosting. The vendors were impressed with not only the overall knowledge she shared, but the depth of tangible details she provided. She definitely has a grasp of the exhibitor market and would be a great resource to any company, entrepreneur or individual who desires to obtain an ROI from their Exhibit Table or Exhibit Booth. Thank-you, Thank-you! All of your suggestions and advice came to use this past weekend at the Asian Festival. The event was very successful, again, Thank-you! 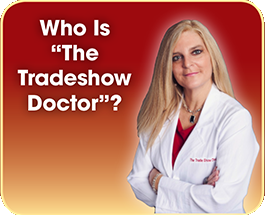 Diane’s ability to diagnose your booth condition and to prescribe the appropriate remedy makes her the outstanding Tradeshow Doctor. 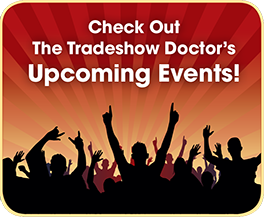 A dose from Dr. Diane has long-term health benefits for your booth….and your business! Too many companies fail to plan, fail to execute and find themselves disappointed with the results of their Tradeshow efforts. 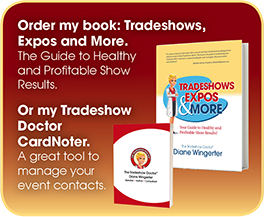 “Tradeshows, Expos and More” by The Tradeshow Doctor, Diane Wingerter is an excellent guide to maximizing your Tradeshow ROI. This book should be required reading for sales managers, show promoters, and tradeshow exhibitors. Diane introduced us to an entire world of marketing that we had never before considered during her presentation on EXPO/Tradeshow Booths. She then proceeded to educate us on the most effective Booth placement and operation so we could maximize our effectiveness for our time and money invested. Thanks to Diane, we now have measurable growth in the EXPO Marketing Category! The Wedding Professionals of Columbus would like to thank-you for speaking at our meeting at Lasting Impressions this week. You gave some great advice and I saw many people taking notes. I really enjoyed your presentation and it was very important to our industry. Thank-you so much!